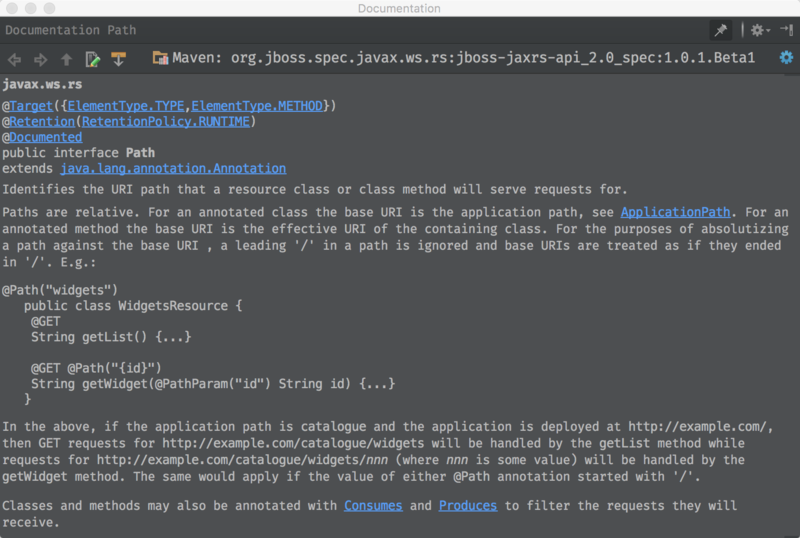 In this article I’d like to share with you my study on JAX-RS SPEC 2.0 Section 3.7 and relative implementations in RESTEasy. 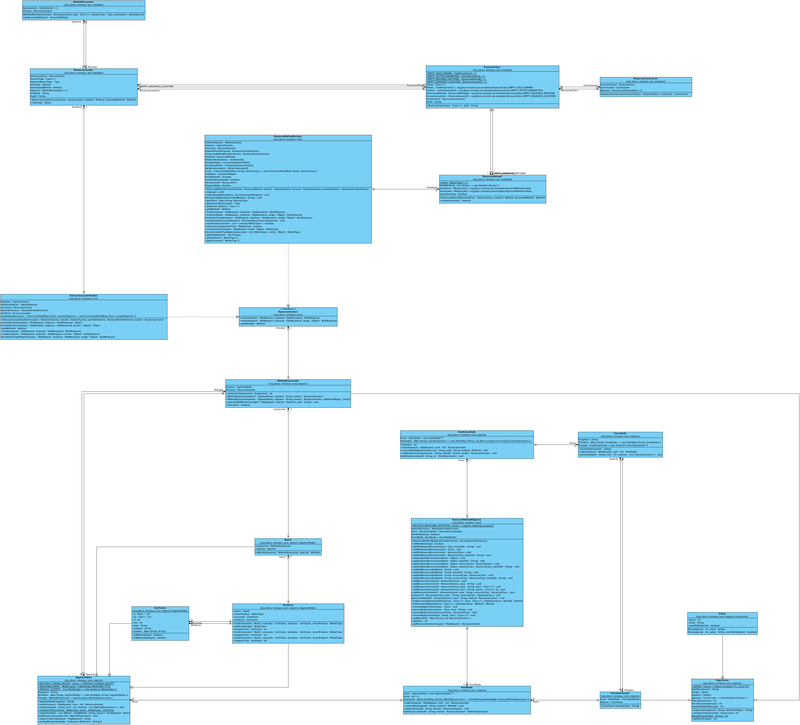 From the above class diagram, we can see some relationships about these classes. Firstly, there are four Node classes, which are RootClassNode, ClassNode, RootNode and SegmentNode. Secondly, there one Expression interface and its two implementations, which are ClassExpression and MethodExpression. From the class name, we can deduce that the Expression classes must contain information for matching the URI path. The ClassExpression class should be used to match classes, and the MethodExpression should be used to match methods. For the Node classes, we can see RootClassNode is only connected with ClassNode, as its root attribute. From the name of the class, we can deduce that RootClassNode is the top data structure in matching process. We can verify this deduction later. Next we should check ClassNode. We can see ClassNode is connected with ClassExpression bidirectionally. ClassNode contains targets field, which has the type ArrayList<ClassExpression>. In another direction, ClassExpression has a parent field, and the type of the field is ClassNode. 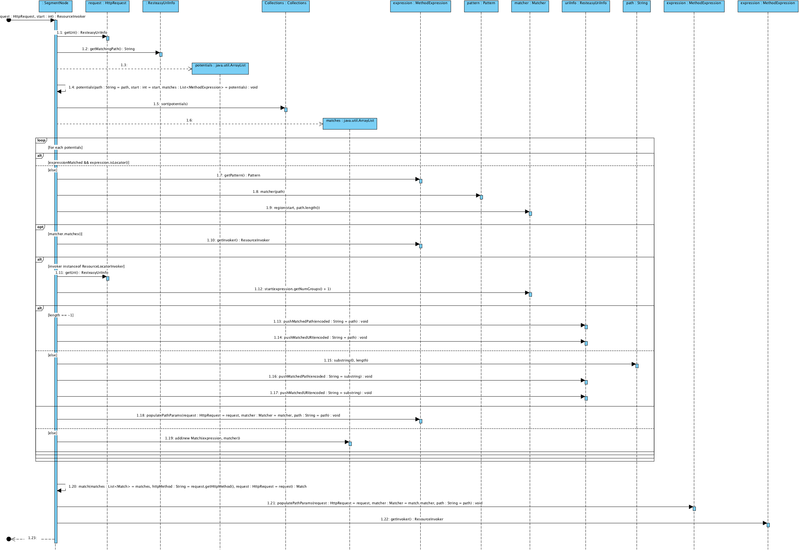 So this is a One-To-Many relationship: one ClassNode instance contains many ClassExpression instances. We need to examine ClassExpression now. ClassExpression also contains a root field, which has a type of RootNode. RootNode contains a root field too, which type is SegmentNode. Now we can check SegmentNode. This class has a bidirectional relationship with MethodExpression, which is simliar to the relationship between ClassNode and ClassExpression. We can see that rootNode : RootNode and root : RootClassNode are used in two different conditions, and the widerMatching variable controls the above logic. 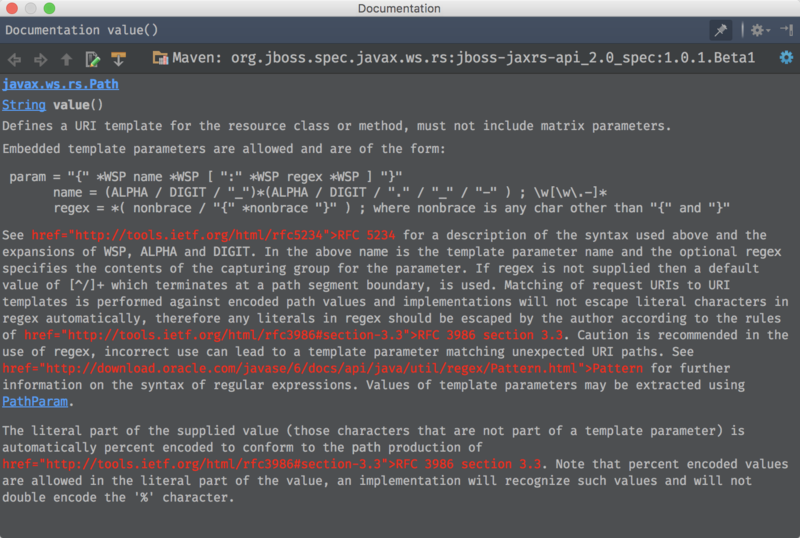 Turns off the JAX-RS spec defined class-level expression filtering and instead tries to match version every method’s full path. 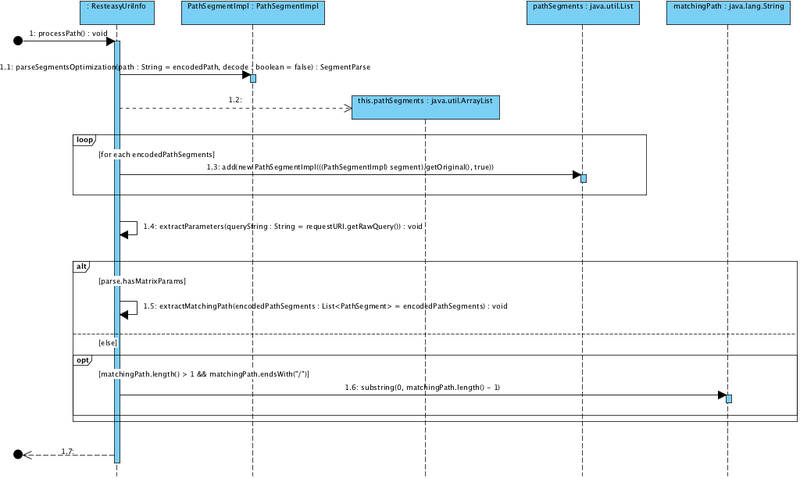 From the above diagram, we can see SegmentNode matching process is simliar to the ClassNode matching process, however the MethodExpression class is used instead of the ClassExpression. In conclusion, the matching processes are mainly in ClassNode and SegmentNode. ClassNode deals with class matching process, and SegmentNode processes the method matching process. From the above definitions, we need to understand the definitions of Resource class, Root resource class, Sub-resource locator and Sub-resource method. Now let’s check Section 3.7.2, Request Matching. If you read through this section, regardless of the detail algorithms, you should catch some basic requirements: Firstly we need to have some candidate resources classes for the matching processes, secondly we need a relative regular expression to each class. This regular expression is actually the pattern of the resource classes that can be checked against the URL requests. Besides the candidate classes, we also need to have candidate methods inside the classes, and we need to store the relative regular expressions of these methods. To sum up the above requirements, RESTEasy has provided a Registry interface and its implementation, the ResourceMethodRegistry class, to support the storage of candidate resource classes. In addition, we have seen there is an abstract class Expression and its two extended classes, ClassExpression and MethodExpression classes to store the relative regular expressions of the resource classes and methods. The Expression and Registry implementations provides basic data unit for multiple Node classes to implement their match() methods. The finally goal is to get a ResourceInvoker, which contains the matched “class.method” and other useful information. 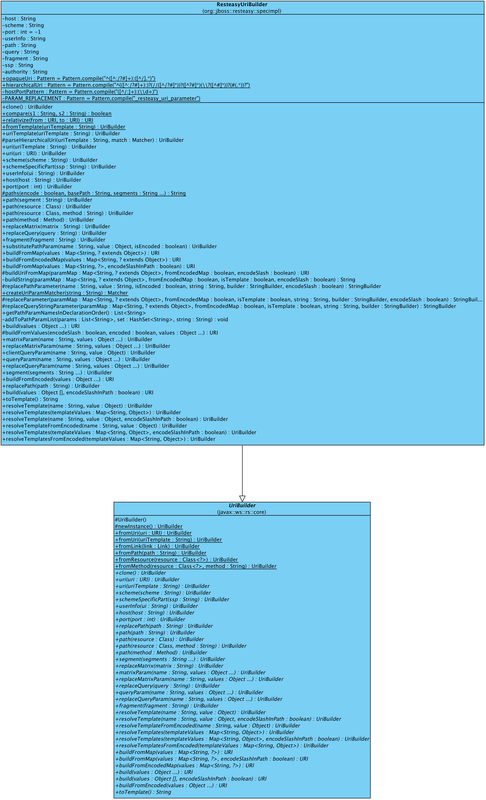 From the above diagram, we can see Registry is mainly designed to store different kinds of resource classes. 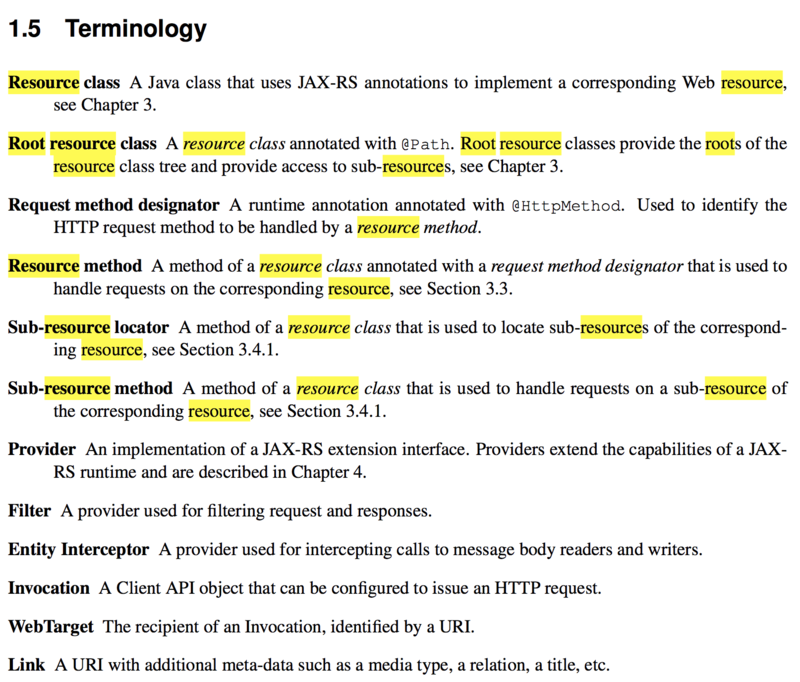 The name of ResourceMethodRegistry is a little bit confusing, be cause we can see in this class are actually stored resource classes. We can see ResourceMethodRegistry connects with RootNode and RootClassNode. We know that RootClassNode and ClassNode are for class matching, and RootNode and SegmentNode are for method processing. 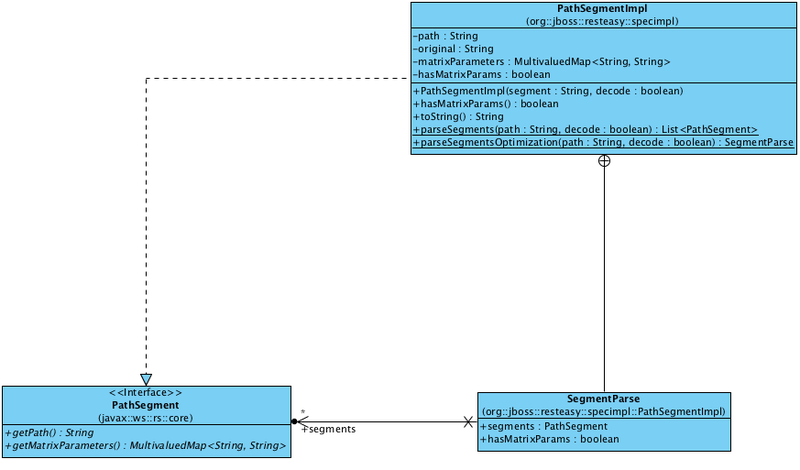 And we also know the class and method matching processes are majoyly in ClassNode.match() and SegmentNode. 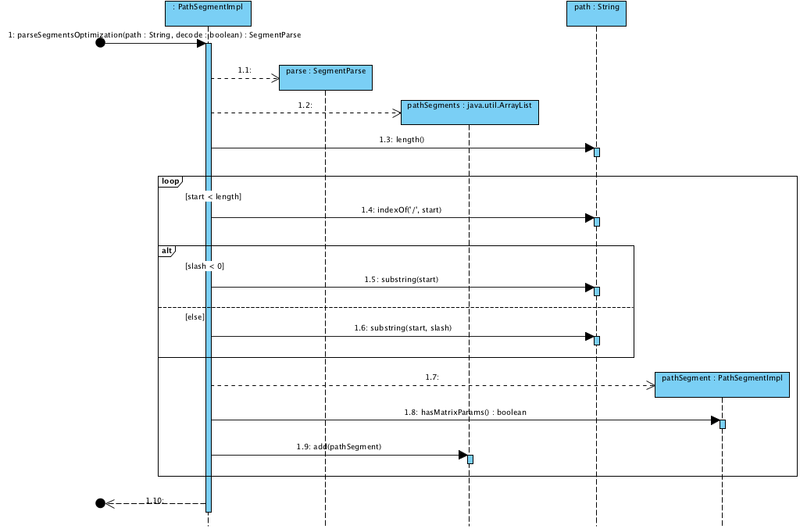 We can also see MethodExpression is connected with SegmentNode, and ClassExpression has a parent of ClassNode, and has a root of RootNode. We can see there are two types of ResourceInvoker, one is ResourceLocatorInvoker and the other is ResourceMethodInvoker. The ResourceMethodInvoker is for the method finally will be invoked by the request, and the ResourceLocatorInvoker is used for invoking Sub-resource locator. 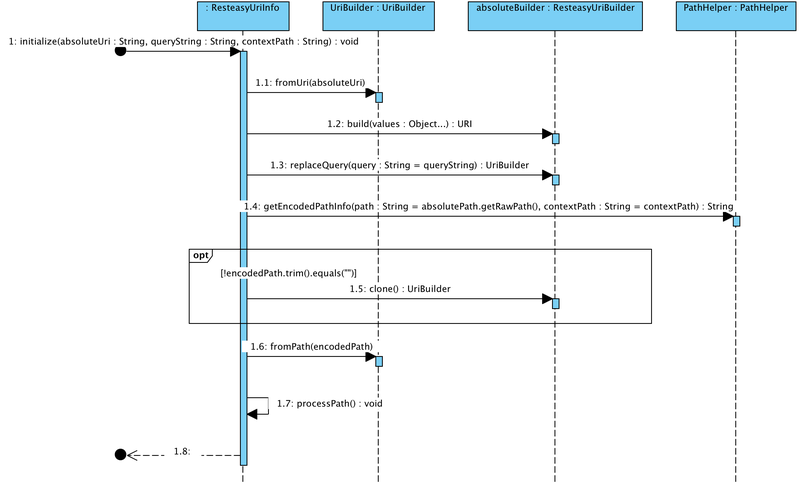 An injectable interface that provides access to application and request URI information. And the getMatchedURIs() method in the RESTEasy implementation, ResteasyUriInfo, should implement the behavior as described in above text. 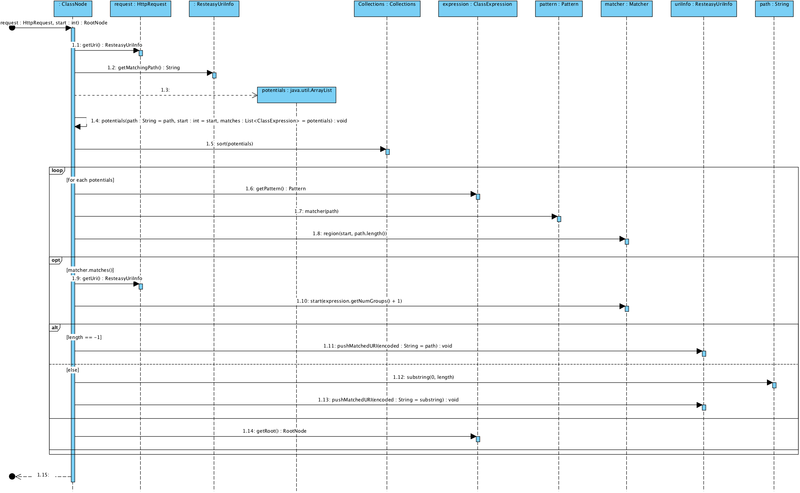 In conclusion, we can see the whole picture is divided into two halves: The bottom half has the ResourceMethodRegistry at center with some Node classes to do the URL path to MethodExpression matching work. The upper half has the ResourceMethodInvoker at center, to do the real method running job. The name of ResourceMethodRegistry is a little bit confusing, actually it doesn’t merely contain and deal with the method information, but also deal with resource classes. Maybe a more proper name should be ResourceClassAndMethodRegistry. We didn’t check the upper half in much detail in this article, because this article is focused on the bottom half of the above diagram. In future, I’ll write the article that focus on the ResourceMethodInvoker side to check how does RESTEasy invoke the matched resource methods.